It's time for another SUPER fun challenge at Really Reasonable Ribbon, and this time our theme is Buttons & Bows......and of course, ribbon! We would love to see your sweet creations using Buttons, Bows & Ribbons. You can pick up all sorts of lovely ribbons, laces, trims and more at Really Reasonable Ribbon to help you get started. I decided to make a sweet Valentine's Day card for my Buttons & Bows project. I used some older Recollections patterned papers that are inked on the edges, a half a doily, and several red buttons with Red Burlap String in their centers. I added a sweet Maya Road chipboard heart that is painted and glittered, and in its center, there is a scrap of red/white gingham material. The sentiment is a Melissa Frances rub-on, and the bow is made from Lipstick Red Seam Binding and Walnut Seam Binding with some sweet stick pins tucked into it that hold a miniature tag. 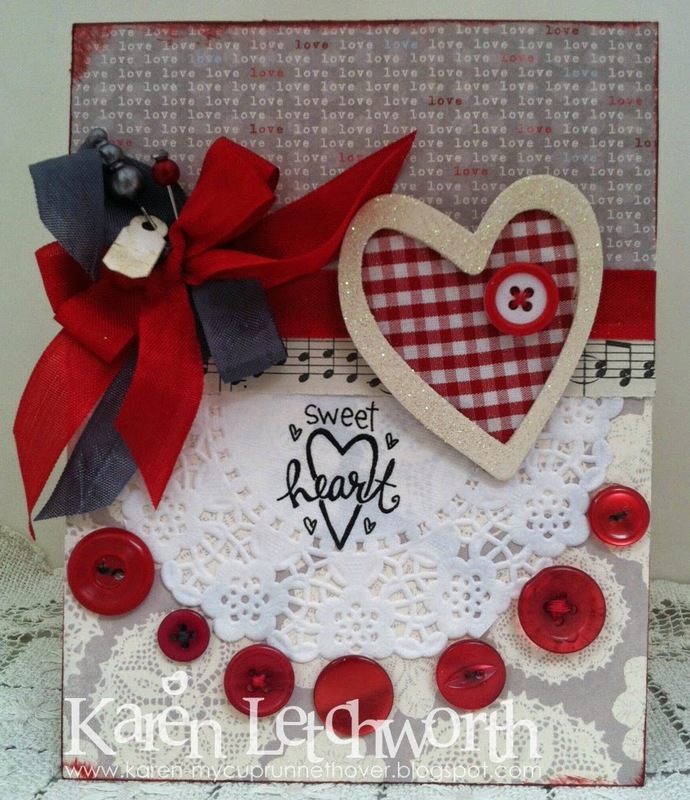 I just love all the great textures including the glittered chipboard heart, the material scrap inside the heart, the ribbons, doily, and........YUM!!!! We really hope that you will play along in our Buttons & Bows Challenge because it's always more fun when you're able to join us. Gorgeous card Karen - love the touch of navy in the bow - it really makes the red 'pop'.